In this part of my Android tutorial I cover 3 ways to save data. We’ll look at Bundles, onSaveInstanceState, SharedPreferences, and PreferenceActivity. We’ll also be reviewing working with components, Intents, click listeners, onActivityResult and a bunch of other topics. 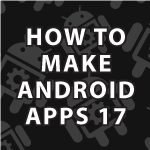 This will begin a series of tutorials in which I cover everything about Android that I have previously not covered. android:summary="Makes the note text bold"